But it's the clever dice-rolling mechanic itself where Dragon Age's system really shines. Players always roll three six-sided dice, one of which is a different color from the others - your Dragon Die. Anytime you succeed at an action and roll doubles, you gain stunt points equal to the number on the Dragon Die. These points can be spent to roll for extra damage, knock an opponent prone, conduct a more effective room search, and more. They can even be applied during social encounters, such as attempting to romance an NPC - which everyone knows is a crucial part of any Dragon Age game. In play, the Dragon die make the lowest of characters into an epic hero. The simplest combat encounter might let you knock an enemy prone, attack multiple enemies, or pull off a violent finishing move in a single dice roll. Players who aren't used to roleplaying banter will find inspiration with stunts that provide a mechanical edge. Instead of flipping through pages for advanced rules - which breaks immersion - stunts keep players focused on the in-game action. In turn, dice rolls get a lot more exciting - and dangerous - when you realize NPCs might use stunts against you. But Dragon Dice go well beyond critical successes. Who breaks the tie during a competitive dice roll? Whoever has the highest dragon die. Want to track player progress on an advanced skill check? Tally the dragon die rolls. Some magic spells even use the dragon die to track bonus damage. It's a simple mechanic that everyone can follow, but has enough complexity to keep the game dynamic with every roll. Dragon Age's mechanics become more complex as characters level up - a side effect of originally designing the game as box sets. Magic is the most significant example of this, as high-level spells increase the chances of a botched roll - potentially unleashing demons from the Fade in the process. It fits the lore perfectly, and keeps high-level play tense, although might be a little hard to follow if you're starting as a high-level character. Other systems, like the Mass Combat rules, are a little flimsier - I once ran a battle the Heroes definitively won without inflicting a single casualty on the enemy. That said, the systems are still effective at making players part of a larger narrative beyond adventures and dungeon crawls. 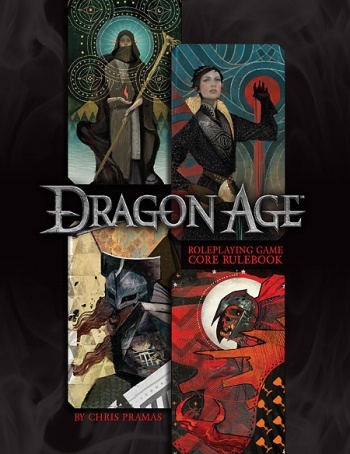 The only real drawback to Dragon Age's core book is that it's a massive core book. When published as box sets, first-time players could focus entirely on rules for low-level characters until they were comfortable with advanced mechanics. Now that Dragon Age is well over 400 pages, parsing the book for useful content will feel more daunting to new gamers. On the plus side, the content is very well organized, easy to digest, features a solid index, and includes lots of helpful advice - especially on the GM front. Besides - this is Dragon Age. Fitting everything into a huge tome just feels right. Green Ronin's take on the game is a fantastic fit for any gamer's bookshelf, and well worth the time to roll up new characters. Bottom Line Green Ronin's Dragon Age isn't just a fantastic RPG adaptation, it's an excellent game period. It doesn't matter if you're a veteran tabletop player, a BioWare fan, or a complete newcomer to gaming. Dragon Age is a wonderful tabletop RPG that absolutely deserves your attention. Recommendation: Buy this game. You won't be disappointed.